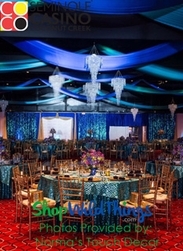 Create dazzling stage sets, wedding receptions and galas with silver chandeliers, beaded silver curtains, garlands, stunning centerpieces and Decorating fabrics from ShopWildThings. 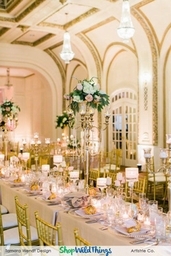 Browse hundreds of choices from our unmatched inventory of silver-color decorations, ideal for all events that are high-style, high-fashion and retro-chic. Shop our pendants, silver vases and candle holders. 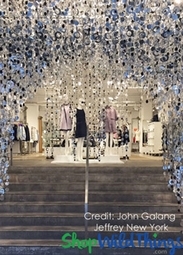 Browse our collections of silvery trees with cascades of crystal jewels, faux gem sprays edged in silver and silver-edged wall and table mirrors. From ornate silver table risers to delicate silver place card holders, our pieces can create a look of subtle sophistication or show-stopping dazzle. 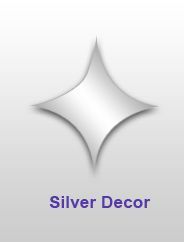 Order rolls of silvery ribbon, diamond-cut crystals, antique silver-look ornaments or rolls of shiny silver circle beads. Shop our glass and silver tone bird ornaments, mirrored disco balls, floral fabric sheeting in silver and silky silver rose petals by the bag. Create an exotic look with our Moroccan-style silver lamps embellished with ornate scrollwork. "Vienna" Tall Tabletop Crystal Candle Holder 27"
SALE ! Mercury Glass Ribbed Candle Holder - Matte Gray - 4" x 4"
SALE ! Real Crystal Candlestick Holder "Modena" Silver - 3 1/8"
COMING SOON! Candle Holder - Cylinder Beaded Real Crystal - "Prestige" - Crystal Gem Pillar - 6" Silver - BUY MORE, SAVE MORE! Mercury Glass Candle Holders - Round "Leslie" Silver - Set of 12 - 3" x 3"
Centerpiece Mirrors - 12 Pcs - Round Glass 9.75"
Centerpiece Mirrors - 12 Pcs - Square Glass 11.75"
Centerpiece Mirrors- 6 Pcs - Rectangle Bevel Edged Glass 13.75"
Centerpiece Mirrors - 6 Pcs - Square Bevel Edged Glass 12.5"
CLEARANCE Metal Decorative Spiral, Sparkly & Shiny SILVER, 8 ft and Extendable! Our website video tutorials will show you how to hang bright silver Broadway curtains or use our chandelier light kits. 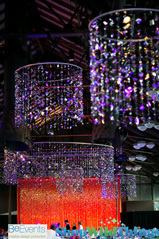 Visit our Photo Décor & Ideas pages to see how our chandeliers have been used for Hollywood galas. 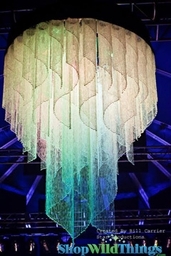 Our bubbles silver curtains were used for a "Dancing with the Stars" stage set. 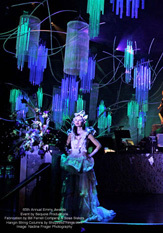 Our client base includes movie studios, television networks and leading names in event planners. Enjoy five-star customer service before and after every purchase.